To prospectively evaluate the hormonal profile and weight loss of women with obesity and PCOS submitted to sleeve gastrectomy (SG). 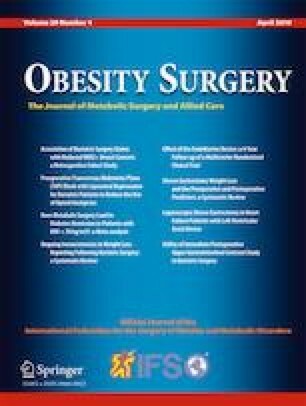 A Prospective study carried out at the Hospital das Clínicas, Federal University of Pernambuco, Recife, Brazil, in 2018, where 18 patients with PCOS, whose age varied from 18 to 40 years, with an indication for bariatric surgery were evaluated. Plasma estradiol (E2), fasting insulin, luteinizing hormone (LH), and follicle-stimulating hormone (FSH) were measured prior to bariatric surgery and 3 months after surgery. The LH/FSH ratio and BMI of the study participants were also calculated. Postoperative E2 levels were higher (preoperative mean of 63.4 pg/dL versus postoperative mean of 91.0 pg/dL), with no statistical significance then (p = 0.139). It was observed, at the postoperative period, statistically significant decreases in mean fasting insulin levels (24.4 mIU/mL vs. 9.0 mIU/mL; p < 0.001), LH levels (7.2 vs. 4.5; p = 0.047), and an inverted LH/FSH ratio (1.5 vs. 0.9; p = 0.008); relevant weight loss occurred (mean BMI, 40.5 kg/m2 vs. 33.4 kg/m2; p < 0.001). Relevant changes in the hormone profile and significant alterations in the gonadotropic and insulin patterns were seen. In addition to satisfactory weight loss, the observed endocrine alterations revealed an internal environment that was more homeostatic and conducive to reproduction, indicating that SG was able to produce attractive physiological outcomes for women with PCOS. All procedures performed in this study involving human participants were in accordance with the ethical standards of the institutional research committee and with the 1964 Helsinki declaration and its later amendments or comparable ethical standards. This research project was approved by the Ethics Committee for Research involving human beings of the Federal University of Pernambuco’s Center of Health Sciences (N. 1.435.611) CAAE: 52297315.7.0000.5208. Informed consent was obtained from all individual participants included in the study. Centers for Disease Control and Prevention. Overweight and obesity: data and statistics. CDC; 2015. Available from: https://www.cdc.gov/obesity/data/index.html. World Health Organization. Childhood overweight and obesity. WHO; 2016. Available from: http://www.who.int/dietphysicalactivity/childhood/en/.